Saving is recording but before Recording comes finding and before Finding comes just wandering around. 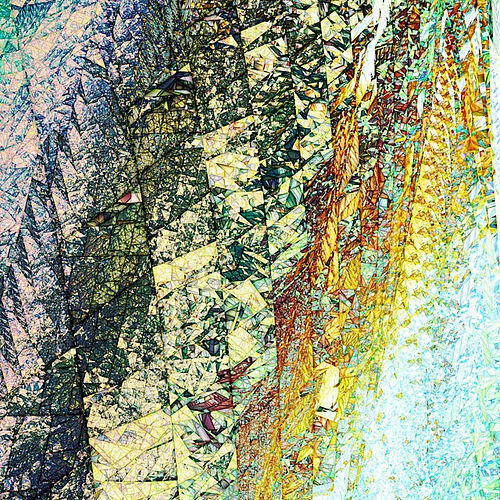 All of Dan’s images here were made with Ultra Fractal which surprised me. 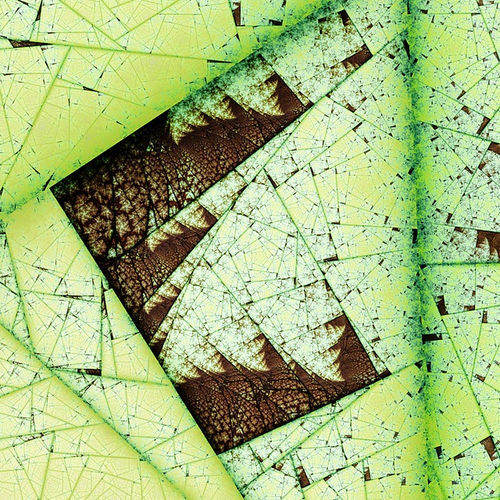 Of course, UF is a widely used fractal program but these are not widely seen fractal images. 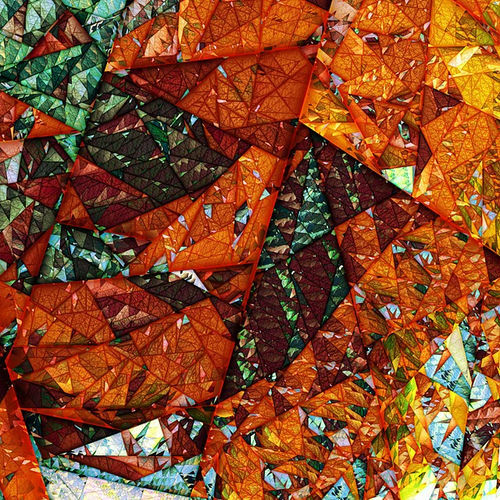 But then, I think Dan’s approach to fractals is different; he’s looking to what the formula can make, not we he can make with the formula; the artist as scavenger and collector. Maybe that’s why his images have a more “natural” look to them; they’re not tweaked all over, they’re found all over. Glass panes and frost-like invaders. Note the wild variation in the structures. This is not the usual sort of fractal with self-similarity. It’s more like the way frost grows on a window pane or how crystals take shape in natural rock formations. This formula is very creative –algorithmically creative. Where would you zoom into next? What a change from the spectrum-ness of that last one. But here the monotone environment seems to accentuate the details as much as the various colors of the previous one made them stand out in uniqueness. In some fractal places you just can’t lose when you’re looking for something that will amaze you. 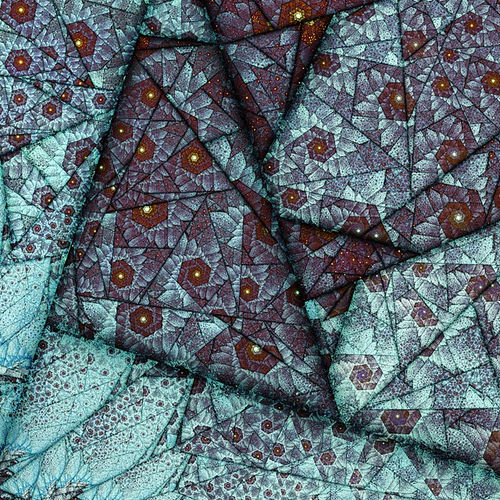 Subtle coloring, like the very first image, but rather than being dull it serves to shine just enough light on the fractal structures to show their natural wonder. Less is more and here’s a good example. Why should such a well known fractal structure be this interesting? Maybe because we never really knew it. From the fiery spirals to caves of ice. It’s a good thing Dan took all these snapshots, otherwise who would have believed such things existed and how would anyone describe them? 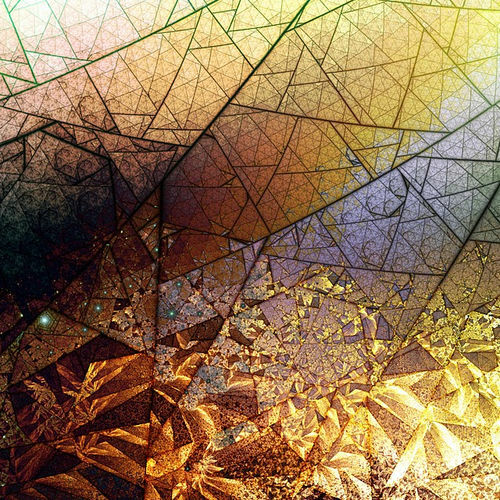 The best way to tell people about fractal art is, as we all know, to show them some. 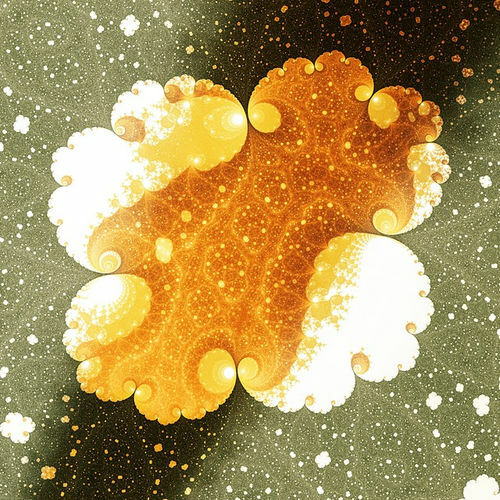 You’d sound crazy if you had to describe fractals with just words. Again, notice the intriguing lack of similarity. That’s algorithmic creativity. The only one that bears a strong resemblance to any other image, this one looks to me like a bright, starry night sky; frozen, broken, and then put back together creatively. Look at the very top right corner; doesn’t that look like a puzzle piece from something completely different? Even fractal formulas make mistakes. If you find these images astonishing, then you should view the entire sequence of them in Dan’s ultraMeta Picasa gallery as well as some of this other Voyages of Sindbad galleries. You may find some of them even better than the one’s I’ve included here, but you will certainly get a better grasp of Dan’s “exploring style.” Like a series of vacation snapshots or the sequence of photos depicting a volcanic eruption, you feel a story unfolding of which you are only looking at a few selected points along the way. Can you believe this comes from the same group of images? It’s not just a great image because of the color and apparent sunlight effect; the red structures have wrinkles and veins like real leaves do. And they recurse into their own little triangular neighborhoods and window frames like they were grown, cell by cell, into this massive sailing ship of a tree. I’m guessing, but I’d say this image comes from zooming into that “map” (Kroma) we saw in the third image. 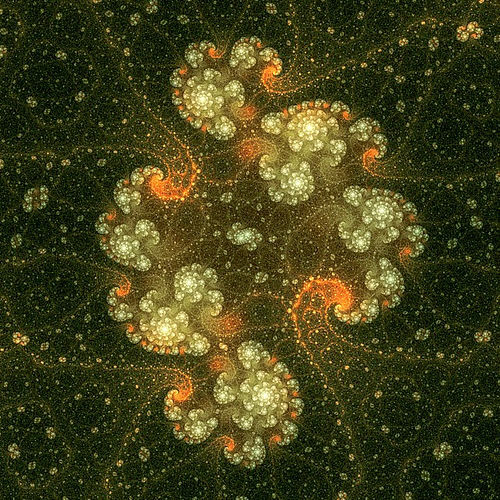 If you’re looking to make a New Years resolution how about taking a little time from your busy fractal art routine and just go on a fractal walkabout. 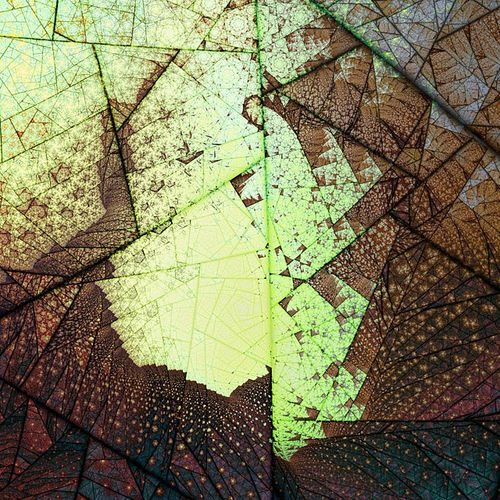 You’ll see fractals and fractal art differently; maybe even for the first time. I’ve enjoyed Dan’s stuff for a while. Thanks for highlighting it. Thanks heaps for taking a look orbit trappers!! I’m so glad that you find my fractal meanderings worthy of reporting! It’s not as up-to-date or as complete coverage of my work as the picasa gallery, but gives a more thematic view. Wow! 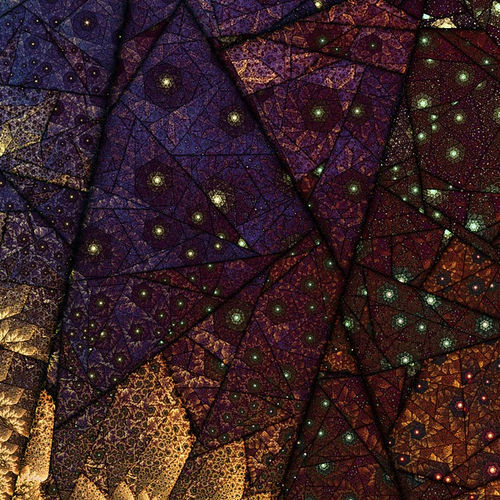 That is some gorgeous fractaling!